Artist's illustration of astronauts on the surface of Mars. It might be a bit easier for humanity to get a foothold on Mars than people had thought. Yesterday (Sept. 28), scientists announced that the strange dark streaks — called recurring slope lineae (RSL) — that appear on steep Red Planet slopes when the weather is warm are caused by salty liquid water. Indigenous Martian water "may be an important resource for future human explorers and inhabitants of Mars, and decrease the cost and increase the resilience of human activity on the Red Planet," said discovery team member Mary Beth Wilhelm, of NASA's Ames Research Center in Moffett Field, California. "Looking forward, it is imperative for us to further understand the source of the water for these features, as well as the amount," Wilhelm said yesterday during a NASA news conference that announced the RSL find. Getting to the bottom of these mysteries may not take long, NASA officials said. "Now that we know what we're looking for with HiRISE, we can begin a better search; we can begin to be more methodical," Jim Green, director of NASA's Planetary Science division, said during the press briefing. HiRISE, which stands for High Resolution Imaging Science Experiment, is a powerful camera aboard NASA's Mars Reconnaissance Orbiter (MRO). HiRISE first spotted the RSL streaks in 2011, and their liquid-water nature was deduced thanks to data gathered by another MRO instrument called CRISM (Compact Reconnaissance Imaging Spectrometer for Mars). "We can look and see if we can determine if there is some sort of aquifer network that may be supplying these [RSL features]. We don't know that — there are other theories, other ideas — but that is actually the next step," Green said. "So if there is indeed those kind of resources that we can begin to probe, we might be able to answer that question pretty quickly." Other possible sources of RSL water include moisture in the thin Martian atmosphere and melting subsurface ice, researchers wrote in their new study, which was published online yesterday in the journal Nature Geoscience. 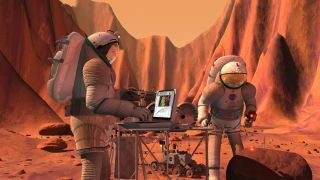 NASA would like its envisioned crewed missions to the Martian surface to live off the land as much as is safely possible. Indeed, the space agency's next Red Planet rover, which is scheduled to blast off in 2020, will carry an instrument designed to exploit indigenous Martian resources. Observations by MRO, NASA's Curiosity rover and other spacecraft have shown that Mars has plenty of other resources that human outposts could potentially utilize, said former astronaut John Grunsfeld, associate administrator of NASA's Science Mission Directorate. Grunsfeld mentioned perchlorates, chlorine-containing compounds that are widespread in Martian soil. The solid rocket boosters on NASA's now-retired space shuttle fleet burned aluminum perchlorate fuel, Grunsfeld noted. "In principle, you could make solid-rocket fuel" on Mars, he said during yesterday's news conference. But water is perhaps the most important resource for putative future Mars explorers and settlers, which is why the RSL discovery is so intriguing to the people mapping out NASA's crewed path to the Red Planet. "The exciting thing is that, I think we will send humans in the near future to Mars," Grunsfeld said. "They'll be scientists looking for signs of life, and also to be able to live on the surface. And the resources are there."